If you're after a classy convertible, no one does it quite like Audi. 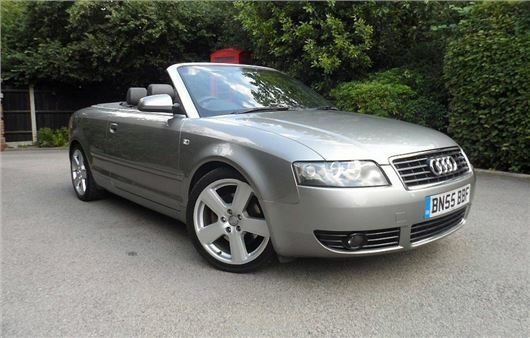 As this lovely A4 Cabriolet shows. On a warm summer's day, this is exactly the kind of soft-top that's ideal for cruising around in. Effortless and elegant, it's still the kind of car to get admiring glances. A feelgood motor if ever there was one. It may be a pre-facelift model but don't let that put you off, in our opinion the original model is neater than the revised version. And in silver with a black roof, it's a classic look. It's powered by the wonderfully smooth 2.4-litre V6 engine which was the 'entry-level' model when the A4 Cabriolet was launched, alongside a 3.0-litre V6. It's no slouch though with 170PS on tap, although this is a car designed more for effortless performance rather than racing around. This model also comes with the much preferred multitronic gearbox rather than the five-speed manual. For £5k you're getting a lot of convertible for your money, especially when you consider that the A4 Cabriolet would have cost at least £25,000 when new. That was for a base model and this S line example has the full black nappa heated leather sports seats along with a Bose sound system. As you can see, it looks well cared for with no wear on the driver's seat or side bolster. The back seats look like they've never been sat in. Although given the lack of rear legroom, that's hardly a surprise. Judging from the photographs, this looks like a very tidy A4 Cabriolet. There are a few things to check. As with any convertible, you need to check the roof works properly. Any odd noises or clunks and it could be the motor on its way out. Also, check the hood itself for tears and holes, particularly where it joins the body. The drains to the sills may require periodic cleaning otherwise water can collect inside them and could start to corrode the metal. Being a multitronic a thorough test drive is essential. Be suspicious of any bangs or jerks as there have been reports of problems with Multitronic electronics causing bangs when drive or reverse are selected. Multitronics must have a transmission fluid change and this should have been done at 40,000 miles. This car has covered 60,000 miles - low for its age - but you still need to check the service history carefully. One thing you won't get with this A4 Cabriolet is very good fuel economy. The claimed figure is only 29mpg and that's on a good day. Start putting your foot down and that will soon drop. But then this isn't a car you'd necessarily buy for the daily commute. Similarly your annual road tax will be pricey at £290 as it sits in Band K. It could be worse though, this A4 Cabriolet is one of the unsual cars that sits in Band K - depsite having CO2 over 225g/km - because it was registered before 23 March 2006. The next band up would cost you £490 a year. It won't be the cheapest car to run, we admit that, but at less than £5000 it's hard not to view this lovely A4 Cabriolet as something of a bargain.